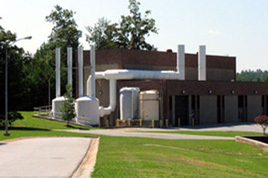 Tech Environmental conducted a thorough odor sampling program and analysis of odor potential at the Gwinnett County (GA) Department of Water Resources (DWR) Crooked Creek Water Reclamation Facility (WRF) during the summer months of 2008. The motivation for the assessment was to determine the demands of the current odor control systems at the facility and to determine whether the current odor control systems should be upgraded, or whether a new odor control approach would be superior. Tech collected odorant-specific data throughout the various seasons of the sampling program so as to best assess the range of loadings to the odor control systems. The assessment included air sample collection from various processes and analysis of those samples for speciated odorants, long-term hydrogen sulfide (H2S) monitoring at locations associated with enhanced levels of odor, field screening of various wastewater processes on an odor intensity scale using an n-butanol standard, and intermittent monitoring of airflow and odorant compound concentrations within existing odor control ductwork. This data allowed Tech to provide Gwinnett County with informed odor control recommendations. The Crooked Creek water reclamation facility's existing odor control system was in need of repair or replacement. Tech conducted extensive odor sampling to determine the existing conditions and used this data to provide Gwinnett County with informed odor control recommendations.